The AD790JNZ is a Fast Precision Voltage Comparator with a number of features that make it exceptionally versatile and easy to use. 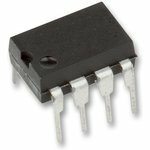 The AD790 may operate from either a single 5V supply or a dual ±15V supply. In the single-supply mode, the inputs may be referred to ground, a feature not found in other comparators. In the dual-supply mode it has the unique ability of handling a maximum differential voltage of 15V across its input terminals, easing their interfacing to large amplitude and dynamic signals. This comparator is fabricated using Complementary Bipolar (CB) process which gives the AD790's combination of fast response time and outstanding input voltage resolution (1mV max). 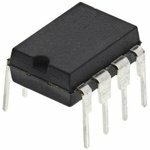 To preserve its speed and accuracy, it incorporates a "low glitch" output stage that does not exhibit the large current spikes normally found in TTL or CMOS output stages. Its controlled switching reduces power supply disturbances that can feed back to the input and cause undesired oscillations.